…and discover the hotel assortment in a virtual model room. 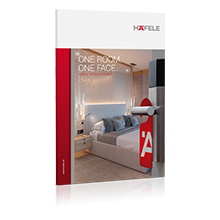 We have developed a 5-star hotel model room to allow you to experience the diversity of the Häfele hotel assortment. You will see numerous products in graphite black in an almost real application. From the door terminal of the Dialock electronic access control system at the entrance, the Loox gooseneck light on the headboard, to the toothbrush holder on the washbasin. Click the red dots to see the products that were installed. The blue dots allow you to switch to the individual areas, e. g., from the bedroom to the bathroom. The icon at the bottom right shows the location and the current direction of view into the room. Here you can use the blue dots to switch directly from the bathroom to the WC, for example, without having to navigate through the bedroom, office/living space, and entrance. Come on in. We wish you an inspiring experience while exploring the Häfele hotel assortment.